Waterfront / White Lake - 3 Bdr - Boat Lift & Dock! Just add fun! Take a retreat, in our relaxing, private White Lake house, with over 35ft of water frontage, the attached dock at the house can handle up to a 24ft boat in size. Home offers over 1100 sq ft of living space, 3 bedrooms, 1 full bath, comfortably sleeps 6-10. The two upstairs bedrooms, one has a queen and the other bedroom has bunk beds with a queen bottom, the downstairs bedrrom has a queen and the lower level living room has a trundle bed. Pullout sofa in the living room. Unbelievable views of the lake can be seen from either the upper or lower level of the beautiful two story wraparound deck. The view is unobstructed and breathtaking. The lower level features a living room & bedroom, laundry area with washer & dryer and storage for your belongings. The upper level is open with kitchen, dining room, and living room all overlooking the water. The kitchen is equipped with a chef in mind, so fire up that grill! Wi-Fi throughout the property and connected to the television for your enjoyment plus DVD. Walk down the stairs to the lake and enjoy the grassy area and relax at the firepit or in one of the many chairs. Go out on the dock and cast a line in where your boat can easily be anchored. Located a short 1.2 miles from downtown where there's restaurants, shopping /grocery and amenities as well as the house being a short drive / ride to Lake Michigan. Extra linens and towels are also provided. Parking for 6 cars or your vehicles and boat trailer, no problem in the front. Has over a 90 foot long boat dock so you can pull your boat right up to the house on the lake. Has a lift that handles up to a 24 foot boat. Usage of paddle boat is available during your stay. The entrance to the Hart-Montague Trail is only less then a half mile away. Silver Lake & Dunes is 30 minutes to the north, where you can rent Jeeps / 2-6 seater dune buggies and ATVs by the hour. All information for all the local attractions, amenities / restaurants will be supplied during your visit. We strive to make your trip as friendly and pleasant as possible. I strive to make your stay as pleasant and comfortable as possible. As a constant traveler I know the pains of being in uncomfortable surroundings. So I make my place as familiar as being at Grandmas house and try to be as eco-friendly as possible. Beautiful Lake, Quiet, Vibrant Town, Bike Path, all the surroundings just make for a relaxing place to get away too! The lake is right outside your door which has a river over 50 miles long connected to it. The photos are old; they do not represent the property today. The outside was was filled with tall weeds, piled metal decking slabs, a snow fence blocking off the water, and generally overgrown and unkept. It did not seem safe to even let my dogs go down, so we never used the yard at all! I will say, the house was clean, and close to Lake MI, which was good, because i only slept there, and left every day. Also, the house is for sale, and my stay was interrupted twice by realtors wanting to 'show' the property; one walked right in on me! I will never return to this place. The location of the house along White Lake was just what we were looking for. The size of the property was also just as advertised, with plenty of room to fit our entire family of 4 adults and 4 children. The owner was also responsive, sending someone over within a few minutes when we called on our arrival to complain that a trashcan had been overturned in the front yard, spilling dirty diapers. However, we had a few issues with the house. First, the property smelled very strongly of cat urine. Leaving the windows open eventually helped dissipate the odor somewhat, but it never entirely went away. Second, the floors of the house are not even, slanting sharply towards the lake. Other than wondering about the structural stability of the house, this did not cause us serious problems, but it made trying to get to the bathroom in the dark somewhat of an adventure. Third, I would not recommend staying here with small children, because the stairs to the lower level are situated in such a way that it would be impossible to use a baby-gate. 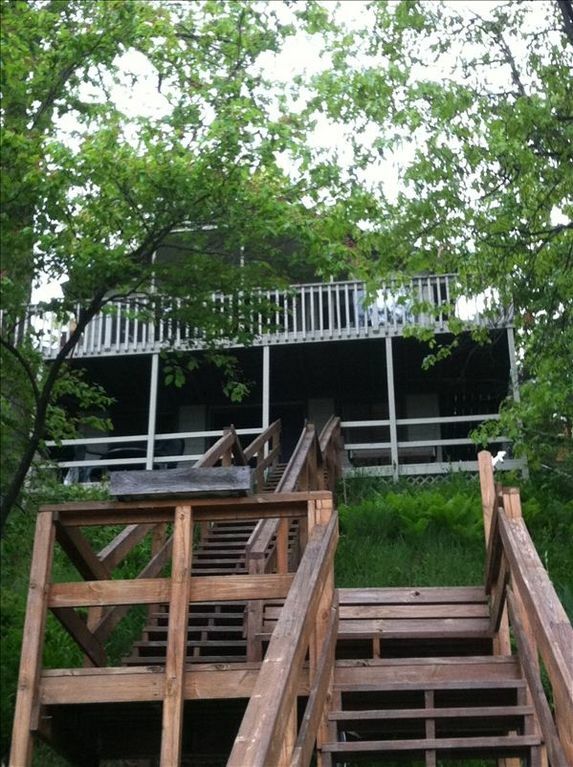 Finally, the description of the house advertised access to the lake and mentioned a "sandy beach." This, however did not exist, and the property's access to the water was largely cut off with neon orange plastic fencing. While there was access to a dock and there was a paddle boat on the property (also mentioned in the description), there was no way to get it into the water. Overall, I don't feel this house was worth the price we paid and I would not return. My family rented the cottage for it’s location and waterfront amenities. We have rented from VRBO in the past and have yet to be disappointed. The owner, Chris was extremely accommodating and helpful in planning are trip. From the moment we arrived we were very pleased with the cottage and it’s central location to everything we wanted to see. We will certainly consider this cottage for future vacations and would have no problem with referring it to our friends and family who may visit he area. The cottage is nicely furnished, clean and very comfortable. The shore line and water was great to play in, the fire bit was used nightly and the kids had a ball with the canoe and paddle boat. We even had deer at the shoreline. Montague and Whitehall are truly only a mile away and are certainly a beautiful place to visit. Lake Michigan is a few minute ride by car or boat and are a must see, if you bring your own boat as we did, Montague has an awesome launch that is free of charge . Silver Lake Sand Dunes are less than 30 minutes to the north. Muskegon is 30 minutes to the south where we visited the Silversides Naval Museum (WWII Submarine), this was truly a remarkable visit. We also drove the shoreline and were truly amazed by the scenery. We Had 2 adults and 3 teens who all slept well with plenty of room for the 4 nights we stayed. My parents, daughter and grandson surprised us with a 2 night stay and the cottage was perfect for all of us. I have given Chris my permission to pass my email address along to anyone who would like to verify the quality of this this cottage. Owner was very accommodating and the house was great. We had a great time and will hopefully go back again. The house was very clean and well maintained, with a beautiful view. We were lucky to have a very nice tv to access our email and watch netflix movies. Only 10 minutes away from Michigan Adventure and very close to grocery store, etc. Our kids had alot of fun on the paddleboat and canoe. There was a sandbox area as well. It was nice to be able to have the downstairs bedroom for the kids to watch a dvd when they needed to unwind. There are stairs going down to lower bedroom and laundry room which made us a little nervous with the little ones being able to fall down otherwise, everything is great. The kids also enjoyed having their own deck. The owner was very friendly and answered any questions we had. We would definately use this rental again. The Silver Lake Sand Dunes for off-roading is within 30 minutes where you also may find animal petting zoos and fun centers for the family of all ages. Owasippe Boy Scout Camp is within 12 miles. The Bardic Mills Meadery is in town, as well as the Maritime Museum. Michigan Adventure is within a 10 minute drive of the house. Coming here is coming to the 'Asparagus Capital of the World'.